Yesterday was a very good day. I finished another sweater last night. I’m so happy to be done with this sweater. I bought the yarn back in early February and have had to take apart the sleeves 3 times because they just came out wrong, or used up too much yarn not leaving enough to finish the project. But its over and I’m happy. =) Its my own pattern, I don’t have a name for it though. 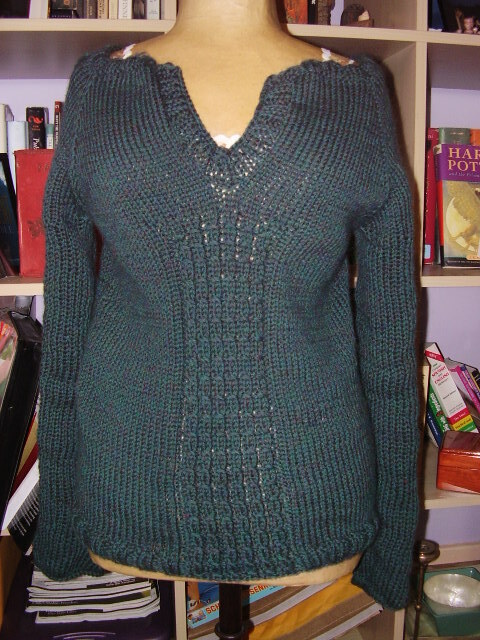 I knit this with 3 skeins of Cascade 220 Heathers in Colorway 9426 (Regency). I knit it in the round top down using a generic raglan cardigan pattern. The front panel is five 2st cables, and the back is two 6st cables, and each sleeve has a 6st cable running all the way down. It fits really snug, even though it looks pretty bulk on the manequin. The sleeves ride up a bit, but I don’t care to buy a whole new ball of yarn, or redo the sleeves for the a 5th time to fix it. I found Supernatural season 2 dvd on sale for $22.99 at Target (I couldn’t find it under $35.oo anywhere online). That’s a full $23 off the normal price! I watched ‘Death at a Funeral’ with my best friend and sister last night. It was one of the more interesting films I’ve watched. Its a british comedy about all this chaos that goes on during a funeral. It stars the ever popular and comedic Alan Tudyk (Wash from Firefly) as a soft spoken man who accidently takes acid thinking its valium, and a dwarf male that tries to blackmail the son of the deceased by claiming he had an affair with the dad, and a large number of imbeciles trying to conceal all of this from the rest of the guests at the funeral. Its british humor…so that take to mean whatever it means. Its smart and funny, but not slapping your knee, laughing so hard you cry funny. I also rented 3:10 to Yuma, which I intend on watching sometime this weekend. I’ve heard good things about it, and I like westerns.